Tina Satter/Half Straddle, Is This A Room: REALITY WINNER VERBATIM TRANSCRIPTION. Performance view, The Kitchen, 2019. Emily Davis. (Background, left to right: T.L. Thompson, Pete Simpson, Becca Blackwell). Photo: Paula Court. TINA SATTER/HALF STRADDLE'S IS THIS A ROOM is a verbatim enactment of an audio recording made by Special Agent Justin G. Garrick, the FBI officer who arrested Reality Winner for releasing classified information. You remember that, right? The world has been remade a thousand times since then, but we shouldn’t forget that we only know the Russians tried to hack our voting machines because a twenty-five-year-old intelligence specialist mailed reports (circulated internally at the NSA) to The Intercept in 2017. 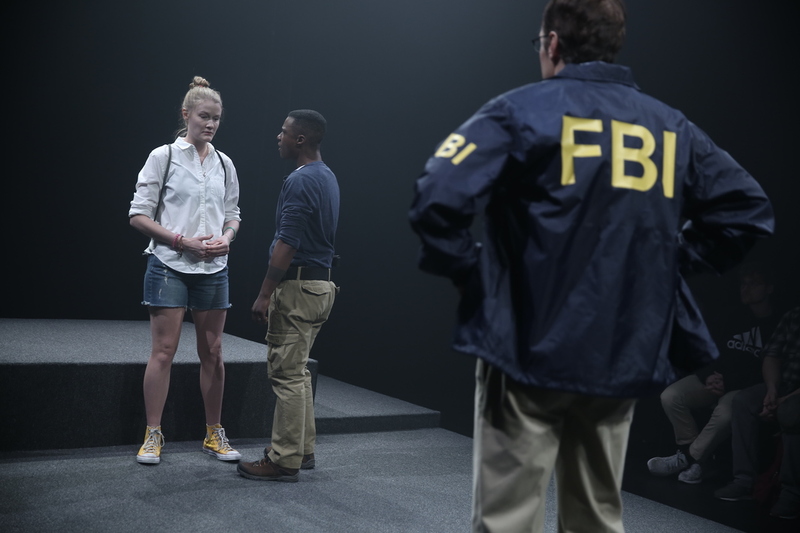 The show stages Winner’s encounter with the FBI team the day they show up—presumably with a warrant, although it takes a while to manifest itself—to search her home in Augusta, Georgia. There, they question her in a disused room that, she says diffidently but repeatedly, gives her the creeps. For a little over an hour, we see Reality shift in real-time from confident and accommodating to crushed—and accommodating. No one in the show is pretending to know anything that isn’t in the official record. Satter took the text directly from documents that were presented in court, and she’s been careful not to mishandle it. You may think you’re at the Kitchen watching some groovy experimental theater group (the preshow music is, I’m pretty sure, Kari Faux), but make no mistake: this play is verified, shipshape, hospital-corners, by the book. Where a word has been blacked out in the transcript, the actors stop talking and the lights pulse deep pink. Once or twice, where longer sentences have been expunged, the room goes completely dark. Bodies reorient and the conversation hiccups. Tina Satter/Half Straddle, Is This A Room: REALITY WINNER VERBATIM TRANSCRIPTION. Performance view, The Kitchen, 2019. Left to right: Emily Davis, T.L. Thompson, and Pete Simpson. Photo: Paula Court. Parker Lutz’s set is as flat and narrow as a redacting stripe—a gray carpeted platform between two banks of seats. The theater is covered in a thick fog; as the play goes on, this haze lifts, eventually becoming a transparent gray ceiling of oily smoke. We can read this as the fog of innocence and unknowing (Reality’s and the electorate’s) clearing up as the situation comes into view; we can also read it as (little-r) reality’s softness turning ugly and flat in the face of interrogation. Director Tina Satter has a fastidious eye and a keen mind for choreography, so the alley-style arrangement of the playing space means that as the mist dissolves, our focus suddenly shifts from Reality—a woman who chose to act—to the row of passive audience members sitting just beyond her. When the lights come up for the first time, it looks like we’re about to watch a comedy. Longtime Half Straddle actor Emily Davis plays Winner, sporty and vulnerable in her CrossFit backpack and Pikachu sneakers, pacing nervously around as three dudes—all of whom are strategically chummy—confront her. And the men are so…frickin’…male. Each performer has come up with a way to spoof the agents’ self-conscious masculinity, and composer Sanae Yamada sometimes even gives them a little musical-comedy sting when they enter. Garrick (Pete Simpson, his hair plastered flat) is always horking up something and snuffling with laughter; Special Agent R. Wallace Taylor (T.L. Thompson) is just itching to reach for their gun; and Unknown Male (Becca Blackwell, growling into their walkie talkie) sports a blast vest, a mullet, and a just-from-the-battlefield swagger—none of which are necessary to take the feather-light Reality into custody. Tina Satter/Half Straddle, Is This A Room: REALITY WINNER VERBATIM TRANSCRIPTION. Performance view, The Kitchen, 2019. Clockwise from left: T.L. Thompson, Emily Davis, Becca Blackwell, Pete Simpson. Photo: Paula Court. Is This a Room is a beautiful work—impassioned yet made with a cool hand; straight-faced yet often funny. It is also devastating because damn, the real world is a hell of a writer. Twice, Reality recalls the day that she printed out the NSA document in question, smuggled it out of her office by folding it in half and stuffing it in her pantyhose, and then dropped it into the mailbox in front of her gym. Why wasn’t she trying harder to hide? “I don’t care about myself at that point,” she explains. When she says it again later, weeping, it is almost too painful to bear. Davis has a long, oval face and looks like she just walked out of a Memling painting. She has also perfected the trick of making her eyes go dead, which she has used in other Half Straddle shows to play roles from sulky teen witches, to pouting cheerleaders, to all manner of eccentric girl-women. 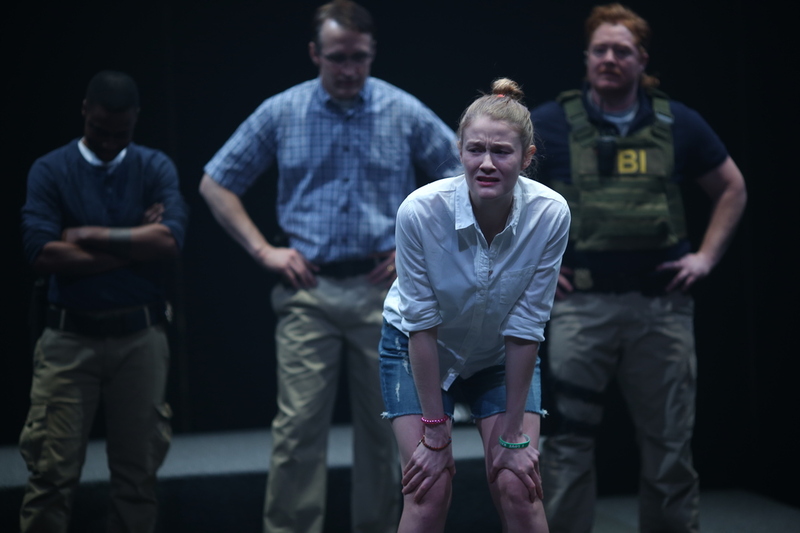 But as Reality Winner, Davis drops the air gap she usually maintains between herself and her characters, proving herself to be one of the most gifted realists in town. Davis gives a microscopically observed, subtle, skinless performance that would even be believable in extreme close-up. It’s literally a stunning performance. Watching her, I felt concussed. Is this…a Half Straddle Play? It feels as though Satter and Co. are upending everything we’ve known about them. Their aesthetic has been High Feminist Camp for the company’s decade together—fantastic drollery like Nurses in New England (2010) and In the Pony Palace/FOOTBALL (2011), and darker kitsch pieces like Family (2009) and Seagull (Thinking of You) (2013). 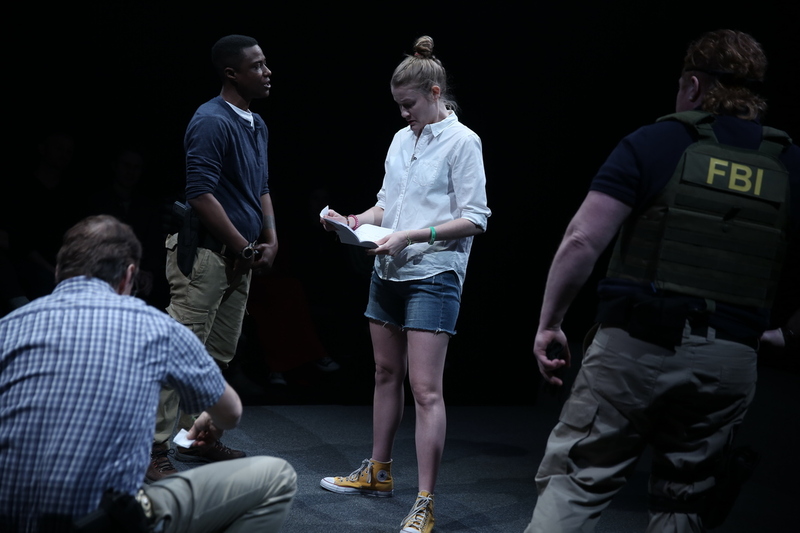 Yet Room is interested in the male presence, particularly its lambent threat, and the play is as straight-from-the-heart urgent as a cry for help. Here they are, the coolest, hippest, most “over it” makers in the schoolyard, pivoting to make a blistering piece of political theater. They’ve kept their powder dry all this time, I guess. And this is the BOOM. Tina Satter/Half Straddle’s Is This A Room: REALITY WINNER VERBATIM TRANSCRIPTION was performed from January 4 to the 13 at The Kitchen in New York City.